This poster of the Dine (Navajo) Universe portrays the basic elements of Navajo astronomy in an easy-to-use fashion. Derived from an original painting done by a traditional Navajo artist, the poster includes the 13 primary Navajo constellations as well as other important celestial objects and their descriptions. The viewer will quickly recognize certain objects in the poster including the Milky Way, and possibly the Big Dipper, Cassiopeia and the North Star. These western objects approximately correlate to the positions of the main Navajo constellations and can help stargazers find the Navajo constellations in the night sky. 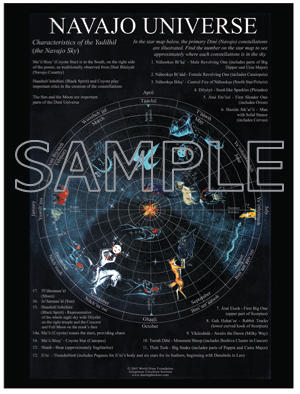 The poster also includes a few short explanations about key elements of Navajo astronomy, but is truly meant to be a companion to the book, “Sharing The Skies,” where in-depth details about Navajo astronomy and the individual constellations are given. This poster is one-of-a-kind. Both the image and the information are unique and have never before been available in such a format. Sorry, but we are unable to accept returns on any products ordered on this website.